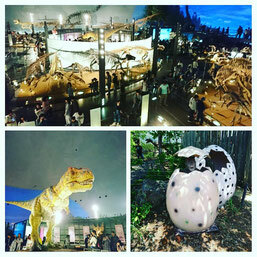 Dinosaur museum Fukui Kathuyama. There're lots of activities, studing about history of the earth, hunting dinosaur borns, looking around immitation big bugs and athletic fields. Fukui is about 2hours from Nagoya, the next to Ishikawa prefecture.